It’s always a pleasure when Houston YA author Caroline Leech drops by. She’s amazingly talented. She’s got this delightful Scottish accent. Her Scotland-set historical novels are engaging, fun, romantic and lush with details that make you feel like you’re wandering the Highlands. Also she says things like “Putting tablet in your coffee is like putting gravy on haggis” and who doesn’t adore someone who can come up with a sentence like that? She also, in full disclosure, brings us treats like the aforementioned tablet candy which I think is basically sugar mixed with some other sugar and possibly a third type of sugar. Caroline is also an intrinsic part of the Houston arts community: She’s on the Inprint board; her husband Perryn is the Managing Director of the Houston Grand Opera and the two of them and their equally talented children are much beloved in this city! So what better time to find out how things have been going since WAIT FOR ME, get a few sneak peeks at IN ANOTHER TIME, and chat her up about Scotland? JOY: Your paperback of WAIT FOR ME released this week, . Can you sum up the brief version of what your debut year and half has been like -- promoting book one while getting book 2 (IN ANOTHER TIME, which will be out soon, and which we will celebrate with your launch party on 8/30! ) ready for the world? 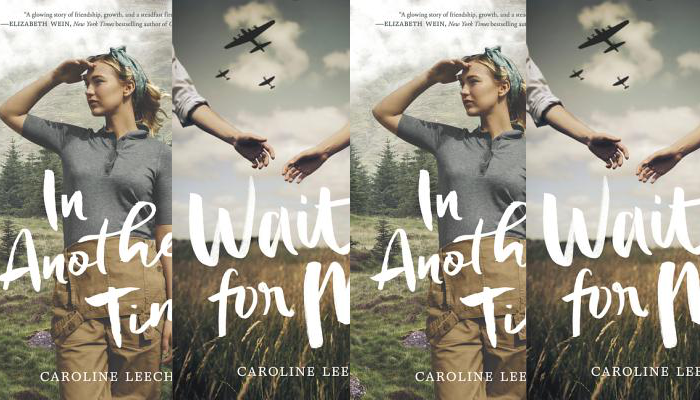 CAROLINE LEECH: It has been such an exciting (though occasionally a little stressful too) year or so sending WAIT FOR ME out into the world while getting IN ANOTHER TIME written, edit and triple-checked. I was lucky that I had finished and submitted the second book before the first was published last January, so the rest of last year was spent in copy edits and proof-checks, which made doing promotion alongside it a little easier than if I’d been actively drafting a story. There were definitely a few times when I got my main characters’ names muddled – swapping Lorna for Maisie, or Paul for John—but luckily the two stories are quite different, so I did manage to keep a handle on which book was which most of the time. Mind you, with the paperback of WAIT FOR ME coming out this week, and the hardback of IN ANOTHER TIME due out on August 28th, my head is starting to spin again. JP: IN ANOTHER TIME is going to return us to WW2 Scotland. What in particular fascinates you about that period of time and Scottish history? CL: I love Scotland fiercely, even though I’ve lived away quite a long time, so I was instinctively drawn to write a Scottish story. Both my parents, as well as numerous uncles and aunts had served during World War Two, either in the military or on the home front (for example, my father and four of his brothers all served in the army, and one of my great aunts was drafted to sew silk parachutes for the Royal Air Force, having been a corset-maker before the war), and my mother and her sister were among the millions of children evacuated from London in anticipation of the bombing. My childhood was therefore full of all their stories about living through the war, and it naturally seemed the era in which to set my first novel, and then my second. JP: And in a related question, tell us a little about IN ANOTHER TIME's protagonist, Maisie McCall. Is she at all like WAIT FOR ME's Lorna Anderson? CL: The two girls are very alike and also totally different! Both girls are loving and loyal, and both are determined and courageous. But whereas Lorna is focused on protecting her home life—her father, their farm and her best friend—to keep it safe until her brothers come back from the war, Maisie can’t wait to get away from her family. She wants to prove herself to be more than they think she is and decides she can only do that by going out into, quite literally, the wide blue yonder of the Scottish Highlands to chop down trees for the war effort. I love them both dearly, and hope my readers do too. JP: When you visited the store today, you brought us some WAIT FOR ME cupcakes and of course, because we're a food-loving group of booksellers and possibly addicted to sugar, we nagged you about making Scottish Tablet candy (which is basically sugar and other ingredients that taste like sugar) for your launch. So seriously, what is it about Scots and sweets? CL: Oh, Scottish people love anything sweet. We have wonderful traditions of baking bread, cakes and cookies, and we have been known to deep fry chocolate bars in batter just to get a sweet treat at the end of a meal. Tablet is a particularly Scottish candy made from sugar, condensed milk and butter… oh, and more sugar… and I first started making it myself when I moved to the US. It’s hard enough to get tablet in England, let alone all the way over here in Texas! But of course, now lots of my friends have become addicted to it too, and every time a make a batch, they start dropping hints by text or email. I tend to make it mostly in December for the holidays and then in January for Robert Burns’ Night, but I will certainly be making some before my book launch at Brazos on August 30th. As for other Scottish chocolate treats, I get them from the British Isles store in Rice Village, so I’ll be visiting there too before the launch party so it goes out on a real (sugar) high! JP: You are such a great supporter of the kidlit writing community. Can you talk a bit about the importance of having a 'tribe' in this crazy industry? CL: tt’s very easy to think of writing as a solitary business, and perhaps the drafting stage of a novel can be done alone. You do have to sit for hours and days and weeks and months staring at your screen, but it can become soul-destroying if you have no one else there to chivvy you along, particularly when things get hard and the writing isn’t flowing. So, I discovered very early on that I could make my writing a much more enjoyable affair by doing most of my writing in cafes, working alongside other writer friends, each of us working on our own project, but also offering accountability and support. Once you get your book deal, of course, you realize quite how many other people are involved in getting that story onto the shelves, from your agent and editor, through all the editorial, marketing and sales staff to the booksellers and bloggers who all work so hard to get books into readers’ hands. It is such a team effort, it feels a little unfair that only my name goes on the book cover. The other ‘tribe’ I could not do without are all the other authors and illustrators I’ve got to know over the last couple of years. Houston has a fantastic community of young adult and kidlit authors and illustrators, as does Austin, and we all come together as members of the Society of Children’s Book Writers and Illustrators, or SCBWI. I’ve also made many great friends among the other authors who debuted in 2017 like me. We have online chat groups where we can all ask questions and share both frustrations and excitements (and there is much of both in this industry). I certainly could not have got through the last couple of years without the support of all these people, and I’m so proud of each one of them as their books are published. JP: You visited Scotland again this summer. What were you dying to see? What do you miss the most that you have to see or do or eat? Is there anything that you miss here in the States when you're 'across the pond'? What do I miss when I’m over there? I miss really good Mexican food and swimming outdoors. And once I’m back here? I miss family and friends, of course, but also historic buildings, Marks & Spencer and the BBC. Oh, and decent cheese and proper chocolate. JP: So what's next for Caroline Leech? CL: Well, I’m working on what I hope will become my third novel. It’s another historical story for young adults, but set some years before World War Two. Until the book is sold though, I feel a little nervous about saying too much more about it, but it is something I’ve very excited about. And of course, I’ll be taking the lumberjills of IN ANOTHER TIME out to visit schools and book clubs through the fall. Thanks, Caroline! This was such fun! If you want to find out more about Caroline Leech, visit her website. And make sure to join us at the IN ANOTHER TIME Launch Party on 8/30 at 7 pm!